The world is inundated with princesses, most of the Disney variety. Ask any little girl to name some of the princesses and they will answer with Sleeping Beauty, Snow White, Cinderella.. you get the idea. They can typically name each of the princesses that they see mass marketed to young girls everywhere. As God being the King and each girl who follows Him.. a daughter, thus a Princess. A real princess of the God variety. Great women of the Bible are the princesses I want my daughter to tell me about when asked about what a princess is. I want her to mention Sarah and her giving birth to Isaac at an old age, Hannah and her prayers over Samuel, The Shunammite Woman and her respect for Elisha. This book of Princess stories is beautiful in that each princess discussed is given a special name such as ‘The sharing princess’ or ‘The remembered princess’. Scripture verses are referenced. A rhyming verse for each princess begins with Mirror, mirror on the wall.. and it doesn’t continue with who is fairest. 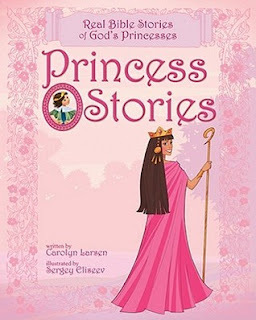 The princess tells their story in their own words, in simple language for a young girl to understand the basics of the woman’s story in the Bible. There are ponderings for your own princess to discuss after you read the story from the Princess Story book. Great illustrations that depict princesses in style and fashion, yet humbled in their circumstances. Geared for roughly ages 6-10. Great for a read aloud or for a young girl to do for a devotional study. These are the true princesses and I was very pleased with the approach the book took to introduce these women of the Bible in a way that would be remembered by my daughter. What a fabulous book idea! I want one for my future grandkids. Where can I find it? Never mind - just ordered it from book depository. This sounds like a wonderful book! I always wanted my daughter to know she was a Princess of the King, rather than relating to some of the more self-centered princesses that are mass-marketed to little girls. I'll be listing it on my site if you'd like to add a review there! Hmm..reading your review makes me want to read it, too.